A diode (also called a p-n-junction)  is a simple electronic device that is formed by simply attaching an n-type and a p-type semiconductor to each other, as shown in Figure 3. On attaching the two semiconductors, a weak insulation zone forms at the edge between them. This zone prevents the negatively charged electrons in the n-type material from combining with the positively charged holes in the p-type material. As seen in Figure 3, the diode has positive and negative charges bunched up on the two sides of the insulation zone. In this state, the diode is said to be turned off. The weak insulation zone can be overcome by applying a high enough voltage between the two ends of the diode. That is, the diode can be turned on by connecting the p-type and n-type semiconductors to the positive and negative ends, respectively, of a power source such as a battery, as shown in Figure 4. This allows the charges to pass freely through the insulation zone. When pairs of electrons and holes collide and recombine with each other, they release energy as flashes of light. Hence the name light emitting diode. When an LED is turned on, millions of electron-hole pairs recombine simultaneously, making the LED appear as if it is glowing like a bulb. 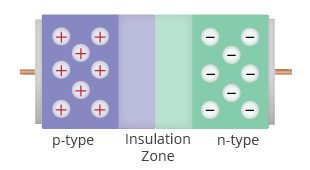 When the power source is disconnected, the insulation zone is formed again, the electrons and holes stop recombining, and no light is emitted. "p-n Diode", [Online]. Available: http://en.wikipedia.org/wiki/P-n Diode. [Accessed: Sept 12, 2012]. "Light Emitting Diode," Oct 2, 2009. [Online]. Available: http://en.wikipedia.org/wiki/Light-emitting_diode. [Accessed: Sept 12, 2012].